By The Associated Press KINSHASA, Congo (AP) - The Latest on Congo's presidential election results. All times local: 2:10 p.m. Belgian Foreign Minister Didier Reynders says his country plans to raise concerns over Congo's contested election at the U.N. Security Council, where Belgium has just taken a two-year seat. KINSHASA, Congo (AP) — The Latest on Congo's presidential election results. All times local: 2:10 p.m. Belgian Foreign Minister Didier Reynders says his country plans to raise concerns over Congo's contested election at the U.N. Security Council, where Belgium has just taken a two-year seat. KINSHASA, Congo (AP) The Latest on Congo's presidential election results. 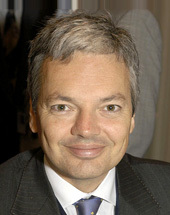 All times local: 2:10 p.m. Belgian Foreign Minister Didier Reynders says his country plans to raise concerns over Congo's contested election at the U.N. Security Council, where Belgium has just taken a two-year seat.